BEN BLUM-SMITH has spent the last 11 years teaching and studying the teaching of mathematics. He graduated from Yale University and obtained a Masters in Teaching Mathematics from Tufts University before teaching for 6 years in the public schools of Boston, Cambridge, and New York City. He has worked as a private tutor for students from age 8 to adulthood, in topics ranging from multiplication and fractions to calculus, combinatorics and analytic number theory. 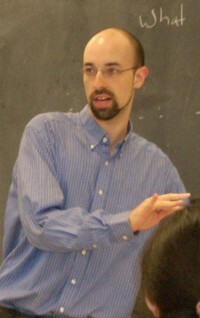 From 2007-2011 he worked as a curriculum and pedagogy consultant for public schools including East Side Community High School, the United Federation of Teachers Secondary Charter School, and International Community High School, and in 2010-2011 was on the faculty of Bard College's Master of Arts in Teaching program. Ben formed Blum-Smith Mathematics in 2007 to house his tutoring practice but soon envisioned a broader scope of activities and began to lead workshops designed to make the delight of math accessible to a wider audience. In addition to workshops offered under the auspices of Blum-Smith Mathematics, he has given lectures and mini-courses at the New York Math Circle, Math for America, Bard College, and the Little Red Schoolhouse / Elizabeth Irwin Summer Institute. Ben's own serious study of mathematics began when he was still in grade school. After some chance events in the fourth grade led him to learn the fundamentals of algebra, he began to learn calculus from his father's college textbook in the fifth grade, and while in high school studied multivariable calculus and linear algebra at night at Harvard Extension School. At Yale, he studied mathematical physics, fractal geometry, real analysis, discrete math and combinatorics. During the pursuit of his teaching degree, he studied abstract algebra at Northeastern University and probability theory at Boston University. More recently he has studied Galois theory, commutative algebra, complex analysis and topology at the Courant Institute of Mathematical Sciences at New York University, where he is currently enrolled as a doctoral student. His dedicated study of mathematics outside of a formal context also continues, both informing and inspiring his practice as an educator.